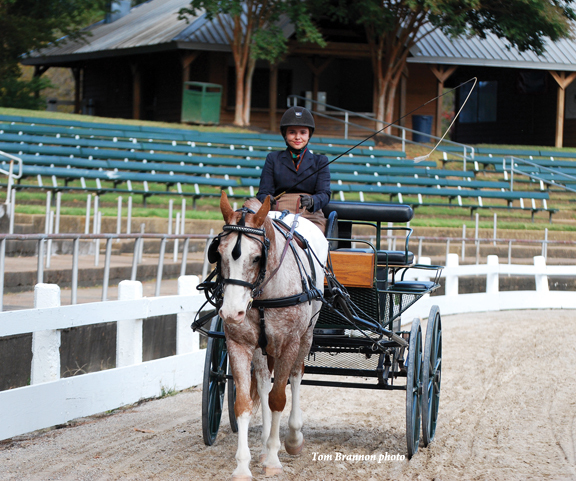 The 2017 Nashoba Carriage Classic and Driving Derby were back at the Germantown Charity Horse Show Arena in Germantown, Tennessee on October 20-22. 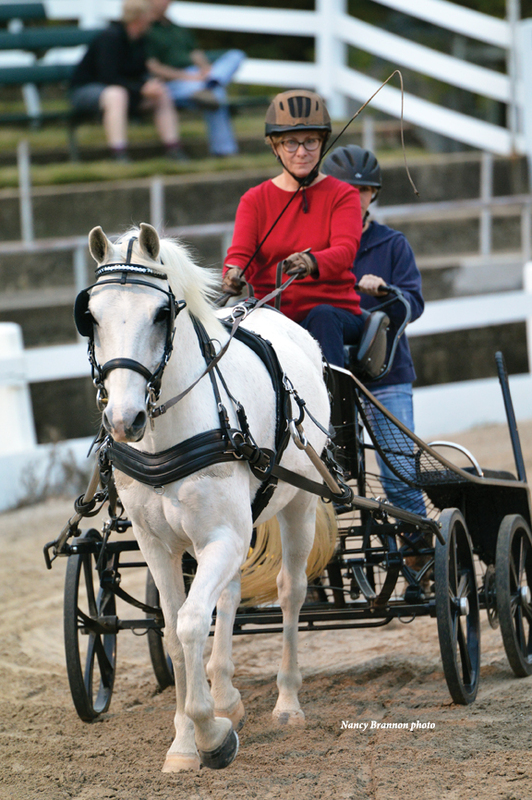 This is the second year for the Driving Derby part of the Classic, but the first Carriage Classic was held in 1999. The show moved to the Germantown Charity Horse Show grounds in 2003, as has been coming back every year since. 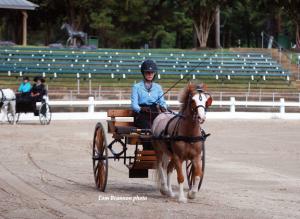 Judge and Technical Delegate for this year’s show was Lynette Partridge-Snyder (IL). 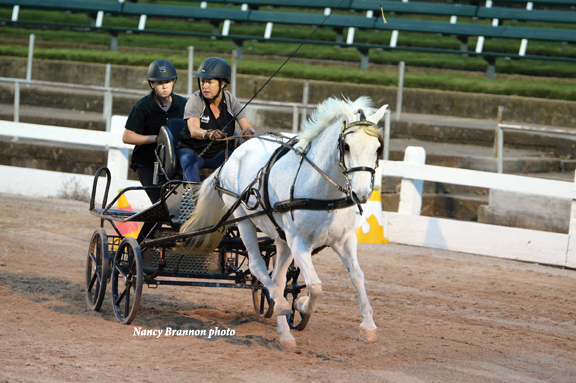 Friday night’s activities started with the Driving Derby in the “bowl.” Sixteen entries took the obstacle course, which included Training Level, Preliminary Level, and Intermediate Level. Categories were Junior drivers, VSE (very small equines), Single Pony, Single Horse, Draft Horse and Pair/Multiples. 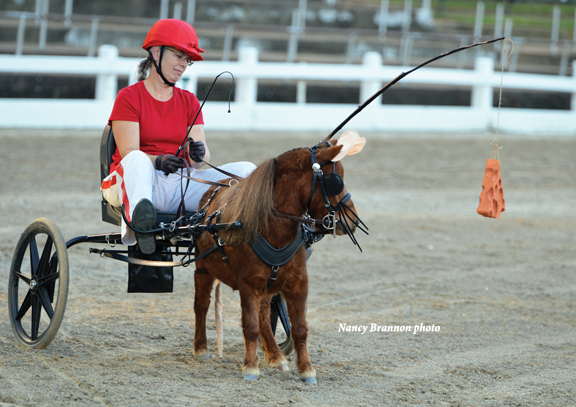 Following the Driving Derby, exhibitors and spectators were treated to the Thrill on the Hill –delicious Hors d’oeuvres to satisfy any hunger. 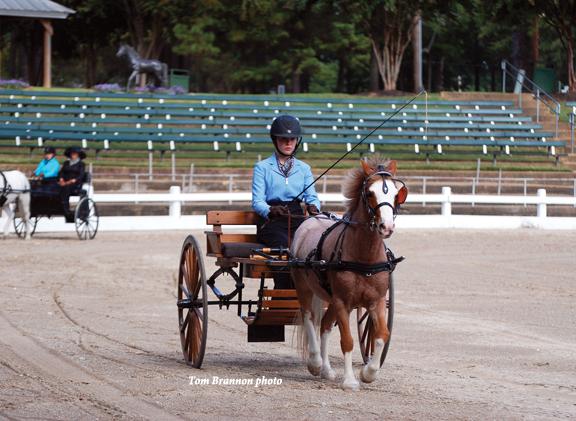 Saturday morning featured the Pleasure show, beginning with Turnout – showing immaculate, stylish, polished turnouts all vying for the coveted Concours d’Elegance trophy. 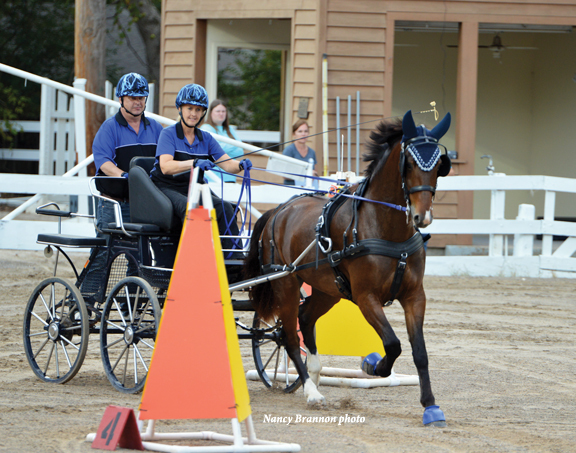 Following Turnout, the Pleasure Driving Classes included Timed Obstacles (driven over a prescribed course of 14-18 obstacles in order), Working (entries judged on the suitability of the horse to provide a pleasant drive), and Reinsmanship (judged on the ability and skill of the driver) classes for all the above-named categories. 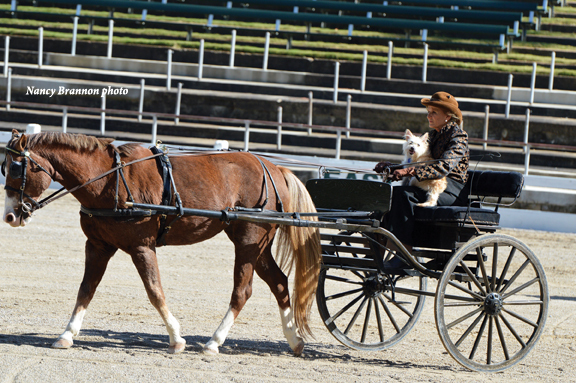 After lunch came many folks’ favorite class: the Carriage Dog class, in which the driver’s favorite canine goes along for the ride. 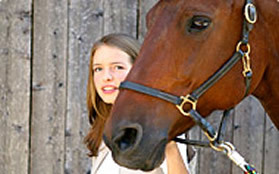 The dog may ride in the vehicle, either standing, sitting or lying down. 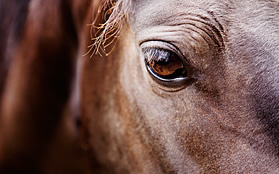 He should be quiet, well behaved and appear to enjoy the ride. The dog may wear a leash but the dog must not be tied to the driver, passengers or to the vehicle. 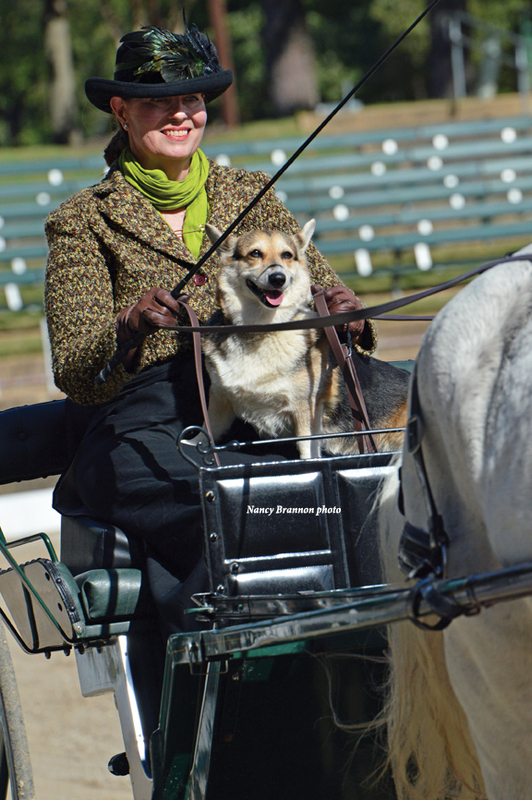 The dog may be held by a passenger in their lap or by a leash. Pam Anderson, driving Rebel, and her Corgie May May were the stars (winners) of this class! 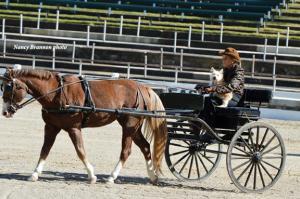 But, in reality, all the carriage dogs were winners! 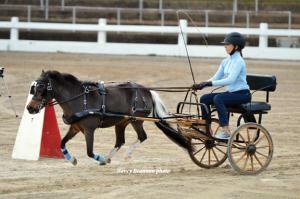 In the grassy area on the hill, drivers took their chances in the Gambler’s Choice class. In this class, drives negotiate a course of unnumbered obstacles, each carrying a specific point value, in the order of their choice. Each driver had 3½ minutes to negotiate as many obstacles as possible, trying to amass as high a score as possible within the time allowed. Joanna Wilburn has always wanted to be Queen of the Germantown Charity Horse Show, so with Rollingwoods Berry Last one dressed as her limousine, Joanna got to “be” the Queen for one afternoon. The winner of the class was Ann Moore’s creative design, Rat Race, in which Mia was dressed as a “rat” complete with whiskers and ears, always following the cheese dangling from the end of the whip. 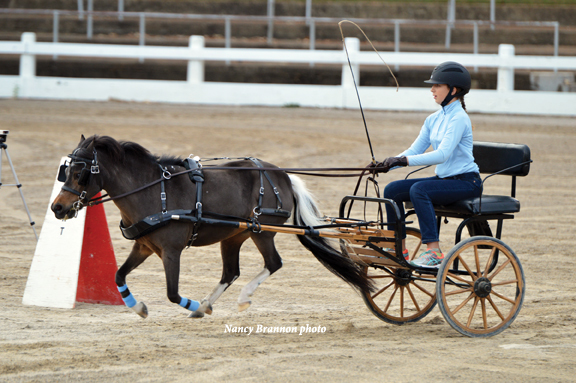 A new feature this year rounded out the Saturday evening show: Side Saddle classes: walk/trot, walk/trot/canter, Hunter Hack 18” and Hunter Hack 24.” Several ladies turned out to demonstrate their sidesaddle riding skills, and the classes were quite a hit. Following the drives and rides, exhibitors and guests were treated to a Catfish Supper, catered by Soul Fish Café. 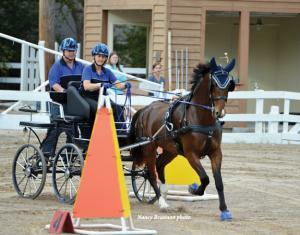 The weather for the Nashoba show was absolutely perfect with sunny skies and warm temperatures. Rain entered the picture for Sunday, but kindly waiting until after the Magnolia Drive. The Sunday drive is approximately 4-5 kilometers through lovely wooded trails in the Germantown woods and neighboring estates – not timed and not to be hurried. Thus the term, “Sunday driver” indicates one driving for leisure and sightseeing. Winner of the Concours d’Elegance trophy for Carriage was Chrissy Daniels and Sammy. 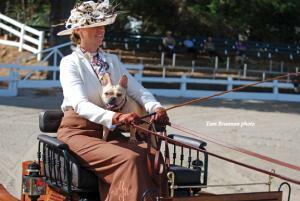 Concours d’Elegance winner for sidesaddle was Pam Anderson and Rebel. 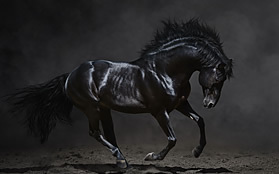 The High Point Welsh Pony was Alex Clarke and Rollingwoods Back in Black.